Within a mere second the Pentacam® supplies you with precise diagnostic data on the entire anterior eye segment. The degree of corneal or crystalline lens density is made visible by the light scattering properties of the respective media and is automatically quantified by the software. Measurement of the anterior and posterior corneal surfaces supplies the total refractive power of the cornea and its over thickness. The data on the posterior surface support in Keratometry for toric IOL calculation and orientation as well as in the detection of ectatic changes. The rotating scan supplies more data points in the center of the cornea. A supplementary pupil camera captures the eye movements during the examination which are later automatically corrected by the software. Unlike conventional topography systems the Pentacam® measures elevation data rather than just curvature values. With its brighter and optimized optics the Pentacam® HR offers you brilliant image quality. The resolution of its images is five times that of the Pentacam® models, enabling the Pentacam® HR to deliver impressive representations of IOLs and phakic IOLs. 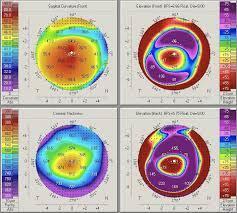 Corneal irregularities as well as injuries, implantations and refractive interventions are made amazingly visible. Additional imaging modes such as the cornea fine scan serve to reveal intracorneal pathologies.